My Dodge RAM is a big blue beast with plenty of power. I have always preferred to own and drive Chevy's. However, the first time I drove my Dodge RAM 1500 pick up truck, I fell in love. Instantly I fell for the power that was behind me, the quick get up and go this RAM held. My daughters and I feel safe and secure in my big bodied blue beast. My chief complaint is the stereo and speakers just are not loud enough for me. The back door speakers didn't have any sound. I did have the stereo swapped out and a speaker box put in under the back seat. My music is much louder now and easier to listen to while I jam out, the windows down, driving just a hair over the speed limit. I do enjoy my new speakers however, I honestly preferred the stock radio over the newer one I had installed. Another feature I adore about my Dodge RAM 1500 pick up truck would have to be the extra space allotted for under the back seat. (this space now holds a custom speaker box. ) I have also had a metal tool box installed in the bed which locks and keeps my tools and emergency kits safe from the weather as well as from being stolen. I love that my truck has four full doors. Oh, also I attached a larger size rearview mirror to see better. 2003 Dodge Ram 1500 crew cab with 225, 000 miles. I really enjoy my vehicle and it has been reliable for the past 15 years. We have kept up with the maintenance and have put the best products you can buy back into the vehicle. This includes oil, tires, air filters, oil filters, exhaust, batteries, and catalytic converter. The vehicle has been so reliable that it currently has 225, 000 miles on it and I expect it to be over 300, 000 by the time any real issues arise. It does have performance issues just like any other vehicle that is this old, being the power it has and it also burns oil quite often within the engine itself, so constant checking the oil is a must. The vehicle also wastes a lot of gas as well, even for a 4. 7l v8 which is a negative since I commute to downtown phoenix for work during the work week. Also the ride is not the smoothest and there is not much cab room as compared to newer trucks, even though it is a four door crew cab. 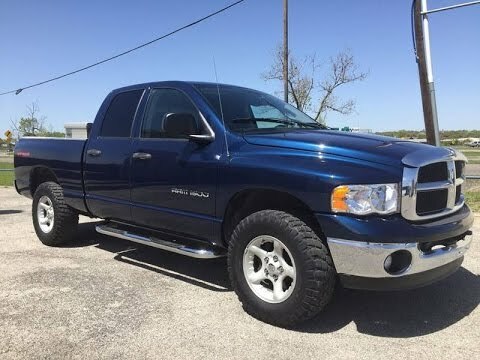 2003 Dodge RAM 1500: big blue. I bought this truck as my first vehicle and I got it used. The biggest problems I have had to do with faulty wiring, belts and stalling. The faulty wiring had to do with my speedometer, when I first got it the only thing that wasn't responding on the dash was the speedometer. We tried fuses and such but that didn't work so we had to get a new dash display, but keep in mind that this is a 2003 truck in 2018. Next, my belt broke after going down the highway, but I do not think the had ever been replaced prior. Lastly, for some reason, for an entire month or so after I bought it, the engine would stall going up any incline.